Tony Judt’s Postwar: A History of Europe Since 1945 is a true volume of historical information. Judt builds the history of Europe since the end of the Second World war into a single, sweeping narrative, a narrative of a time which he himself lived through. His attention to detail and analysis creates has created what is widely viewed as one of the most comprehensive accounts of the post-war period in Europe. From a historiographical perspective, Judt’s own personal experience of the time he writes of raises questions about the construction of history and its relationship to the present. One has to question Judt’s narrative as a relation to his own personal experience of the time, and to how much it focuses on his interests, and his perception of the time. His relationship to the politics and conflict of the time becomes complex as it emerges that these were events the impacted his everyday life. Judt cannot be an objective observer as this is so close to his own reality, and the question of what this means to his history shall be explored in this review. Judt’s proximity to the period of which he writes prevents him from seeing the events from a distance, and examining this reveals the role of the historian in creating history. Despite the fact that Judt set out to build a comprehensive history of Europe in the postwar period, the nature of history is that it is interpretative, making it near impossible to create a complete history that included all aspects and events. In this regard though, Judt’s relationship to his history means that his notation of it is undeniably influenced by his experience. Judt recognises this, noting that it “renders the dispassionate disengagement of the historian quite difficult to find.”The events and perspectives that he chooses to include and privilege are informed by him and his experience, despite his best intentions. This can be seen as throughout the entire work as despite the relevance of both these issues to the postwar period, Judt barely mentions the role or contributions of women through the period and only touches on the rapidly evolving situation in Ireland in relation to other countries. While he discusses nationalism in great detail, he fails to truly address the power of regional identity in politics and history, an oversight which weakens the value of his work to the current day. Similarly, his understanding of trans-European social factors throughout history is of immense value, but in failing to provide any focus on specifically women’s roles he silences a large portion of the foundation and intricacies of these social movements. The central idea of Mark Bloch’s book The Historian’s Craft revolves around the theme that a historical phenomenon can never be understood apart from its moment in time, that the historian must step back in time and must return to the milieu of their subject in order to be immersed in the mental climate of their time and faced by problems of conscience different to their own. Bloch questions the purpose of historical science, specifically examining how and why transitions take place over time, and the role of their environment in making them, and focusing on the importance of understanding these, writing that the “misunderstanding of the present is an inevitable consequence of the past”. Through his emphasis on the importance of the historian stepping back in time when creating a narrative, Bloch reveals the core value of history – that it permits the past to be translated into something that can be understood and learned from. In discussing documents and evidence, Bloch writes that the historian’s knowledge of the past is necessarily indirect, and the primary source evidence which he is able to construct is often through the lens of experience of a certain actor, distorted to this actor’s perspective and willingness to disclose information. The idea of time is central to his analysis of history, as he notes the role it has in the conveyance of information, as information can be altered through time, but also revealed over time and circumstance, as Bloch notes when calling attention to the passion for secrecy amongst humans. Additionally, Bloch calls attention to the limitations of history through the access or lack of access to documents which allow it’s construction. Judt’s writing of history as a contemporary of that history means that he does not have this advantage of the passage of time. He does not return to ‘problems of conscience’ situated in a context different to his own, as they are the problems of the time that he lived in. In a similar vein, Judt’s lack of distance from the time of which he writes means that he does not have complete access to the full range of sources that may be revealed over time. The recent release and analysis of archives, particularly those of the highly inaccessible Soviet bloc, and their impact for the history of that region would have a major value to Judt’s history. Judt has created a historical narrative informed by his own experience of a period, and as a result cannot utilise the perspective that time gives to history. His history related to his own understandings of politics, allowing for silences and omissions to certain aspects. The most evident example of this is in his history of the Cold War history, a clearly Western account influenced by the context in which he lived. He creates a divide between the two countries, simplifies the decision making of the Soviet bloc and lauds Western action. He has no time for the actions of Soviet leaders, failing to gain any sort of perspective on the positive aspects of what they tried to do. This sort of one-sidedness to history is no new development, but the intimate, lived experience of Judt makes including a wider, more inclusive perspective on events much more difficult, perhaps impossible. While this might be a natural occurrence in the creation of history, as a piece of popular history it mean that these perspectives are not received by an audience highly educated and analytical about this subject, but rather by one that wishes to learn more. As a result, Judt’s history is just accepted for what it is, and these silences and focuses are perpetuated through time. The value of looking at Judt’s book in this light is the relationship that it reveals between sources and history. In a time when we have excessive amounts of access and availability to all sorts of documents, the question of how history will evolve in the future, to deal with the extreme wealth of sources and documentation emerges. In arguing the value of primary sources over secondary ones, Bloch states that, without reference to primary sources, historians would ’fall prey to the same prejudices, false inhibitions and myopias of the previous generations’. Looking at Judt’s relationship to the history he writes, one can see how these prejudices, inhibitions and myopias emerge despite the best intentions of the historian. This raises the question of how, or whether, one create a history of a time through which one lived, as the personal societal prejudices of that time still reveal themselves in your perspective. In this way, Bloch answers his own question of what is the value of history, alluding to its role in stepping back in time, trying to recreate the world at the time, whilst also analytically examining it through a range of perspectives provided by documents and the historian’s personal distance from the subject or period. Bloch maintains that transfers of thought between generations supply the true continuity of civilisation, and this idea of ‘transfer’ is what Judt’s Postwar lacks, weakening its value as a historical piece. Bloch, Marc. The Historian’s Craft. New York: Knopf, 1953. 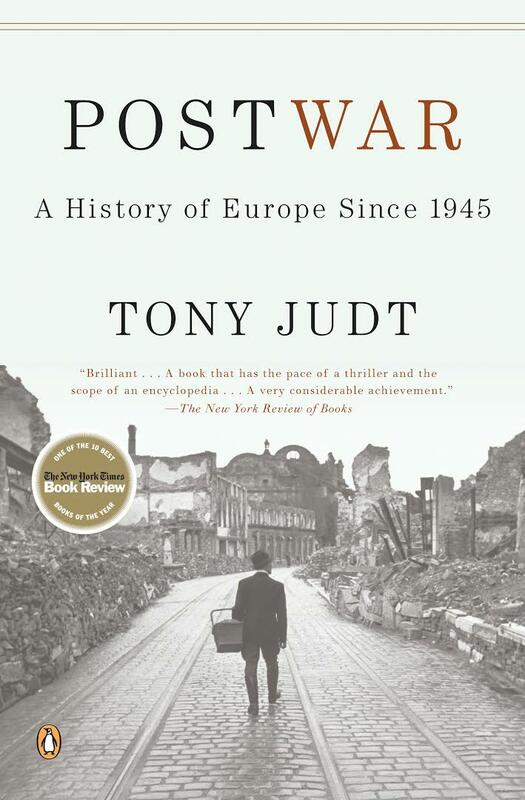 Tony Judt, Postwar: A History of Europe Since 1945, (New York: Penguin, 2005), xxii. Marc Bloch, The Historian’s Craft (New York: Knopf, 1953), 35. Published by Laura Madokoro on April 6, 2017 at 2:34 pm under Uncategorized.